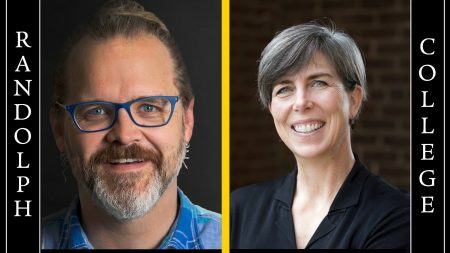 Randolph’s fall 2018 Visiting Writers series continues this Wednesday, November 14, and features two of its own English and creative writing professors, Gary Dop and Laura-Gray Street. The event begins at 8 p.m. in the Alice Ashley Jack Room inside Smith Memorial Building, and is free and open to the public. Both faculty members will read from their latest works. Street’s latest publication is the chapbook of poems, Shift Work, and Dop’s second collection of poems, Earth Never Settles, is due out in 2020 from Red Hen Press. Street is the author of Pigment and Fume (Salmon Poetry) and Shift Work (Red Bird Chapbooks) and co-editor (with Ann Fisher-Wirth) of The Ecopoetry Anthology (Trinity University Press) and (with Rose McLarney) of A Literary Field Guide to Southern Appalachia (University of Georgia Press, forthcoming). She has been the recipient of poetry prizes from The Greensboro Review, the Dana Awards, the Southern Women Writers Conference, Isotope: A Journal of Literary Science and Nature Writing, and Terrain.org: A Journal of the Built and Natural Environments. Her work has been published in The Colorado Review, Poecology, Poet Lore, Poetry Daily, Hawk & Handsaw, Many Mountains Moving, Gargoyle, ISLE, Shenandoah, Meridian, Blackbird, The Notre Dame Review, and elsewhere. She is supported by fellowships from the Virginia Commission for the Arts, the Virginia Center for the Creative Arts, the Artist House at St. Mary’s College in Maryland, and the Hambidge Center for the Arts and Sciences, where she was the Garland Distinguished Fellow. Her 2017 collaboration with UK visual artist Anne-Marie Creamer is currently on display at the Yantai Art Museum in Yantai, China. Street holds an M.A. from the University of Virginia and an M.F.A. from the Warren Wilson Program for Writers. She is an associate professor of English and directs the Creative Writing and Visiting Writers Series Program at Randolph. Dop is the recipient of the Great Plains Emerging Writer Prize and is a Pushcart Special Mention, and his work has been featured on public radio’s All Things Considered. His first book of poems, Father, Child, Water, (2015) was a bestselling collection with Red Hen Press, and his follow-up collection, Earth Never Settles, will also be published with Red Hen Press (2020). Dop received his M.F.A. from the University of Nebraska. In addition to directing the M.F.A. program, Dop is an associate professor of English at Randolph, where he teaches poetry, scriptwriting, and creative nonfiction. Dop dabbles in stage and film work as a writer, actor, and director, and he helps manage Rain Taxi’s Twin Cities Book Festival. The Randolph College Visiting Writers Program brings professional writers to campus from a variety of backgrounds and genres (fiction, non-fiction, poetry, journalism, play writing, etc.). Visiting Writers meet with students, conduct workshops, visit classes, give public and private readings, and conduct book signing sessions.